This is Elijah’s second Easter. Last year he was too young for chocolate so I just gave him a little bunny I made. I’m not a religious person, so Easter doesn’t have a lot of meaning to me in that sense. I celebrate it as a family day where we receive a bit of chocolate and that’s about it. I do like family traditions though and this year we started ‘pyjamas for Easter’. 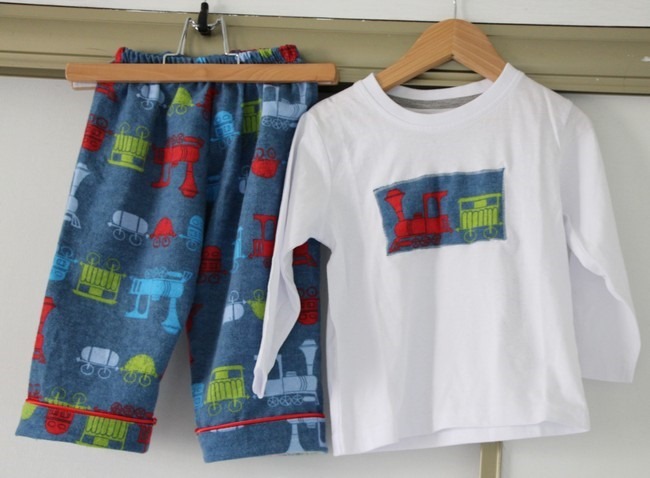 I made these with some flannelette from spotlight last winter and simply appliqued a train onto a store bought top. I tried out piped cuffs for the first time and was very pleased with the result. Look! Not bad for 9:30pm on a Saturday night! Next time I’ll attach it differently so there’s no visible stitching, but for a pair of pj’s I’m more than happy with this one. Col and I like to have an egg hunt; a tradition we started in 2011 when I was pregnant with Elijah. This year was fun as Elijah actively took part and used this little basket I made him to store his eggs. 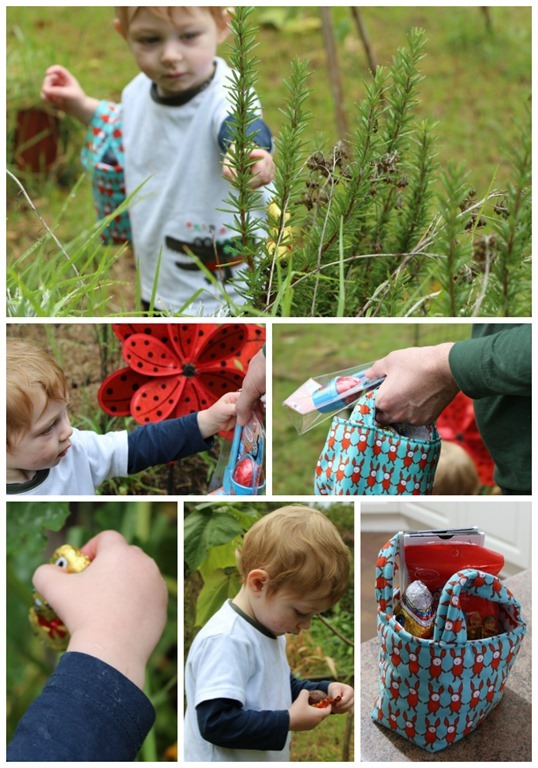 Egg hunt! He wanted to unwrap and eat the eggs right away, but he thought the bunnies were for playing with and hopped them around the grass. Cute! I love the piping too! 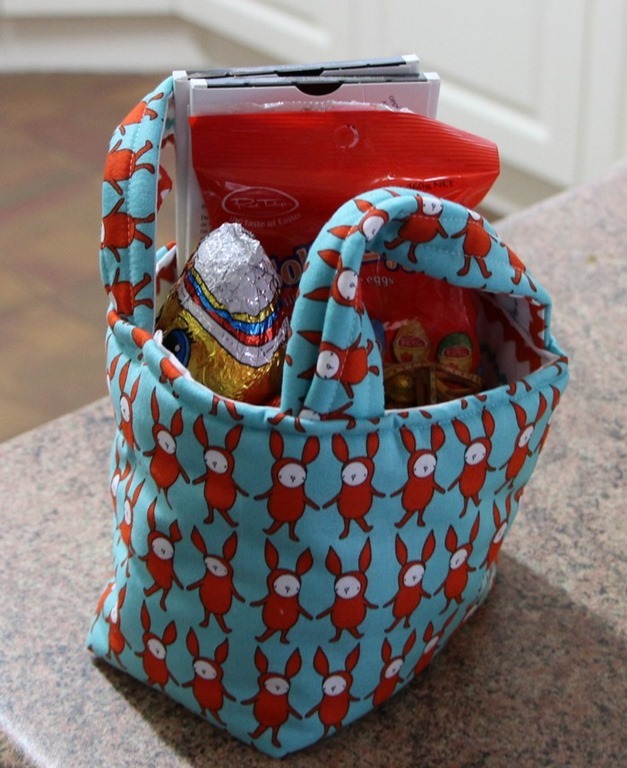 Also that little bag with the eggs in it is gorgeous! Love the flanny PJ’s – I’m thinking about making some for my little boy! How many chockies did he eat?? I had a great day with you all, thank you! and would love some more instructions . . . I found your stop pinning start doing board; Love the idea. (it was over 12 months ago, has it been updated and I just can’t find it or ?? I am like you – so many projects begun and not finished, some of which go back years – especially cross stitch pieces, makes me want to retire and get on with it all.